The Limbaugh eulogy is a sure sign that the illicit OxyContin addiction that likely made him deaf has clearly numbed his shame. The penchant for lying, however, is a preexisting condition. Gloating inaccuracies about the departed owner of the New York Yankees move me to violate one of my rules of commentary: Never kick a dog even when he's up, especially a mangy one frothing at the mouth. Unfortunately, Limbaugh's untimely comment deserves attention this time because the base sentiment is deeply held by millions of Americans who swoon on every word that falls from his lips. Limbaugh was born in Missouri and should know that, unlike himself, Ohio-born Steinbrenner—who owned the ''Yankees'' for crying out loud—is not technically a ''cracker.'' In terms of white-racist consciousness, again, it is Limbaugh, not Steinbrenner, who tops the leader board. As for black players, the Yankees owner did not make them millionaires. Steinbrenner earned his billions, and his teams won seven world championships along the way, by paying the going rate for ''free agents.'' And if anyone, along with the players' marketable skills, made this value assessment a reality—it was Curt Flood. In Steinbrenner's case, the Yankees paid million-dollar salaries to far, far more white players over the years than blacks. It is the peculiar impulse of bigots like Limbaugh to single out successful African Americans in such cases as undeserving and to imply that their earnings are diverted from compensation due to privileged white players. In his post-mortem salute to Steinbrenner, Limbaugh protests that "The Boss," as he was commonly called, ''fired a bunch of white guys as managers left and right.'' Here the radio lie-addict nods off under a near overdose. While it's true that Steinbrenner fired a number of managers—Billy Martin, a record five times—all of those he hired and fired were white. Thus, The Boss can be criticized for firing too many managers; he cannot be criticized for firing too many white managers. 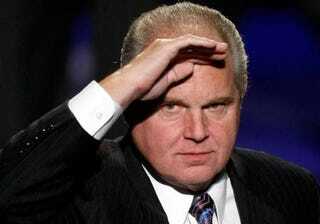 As always, the toxicity of Limbaugh's race bigotry gets the better of him. If anything, The Boss could be criticized for never hiring a black manager for the Yankees. But Limbaugh, of course, won't go there. And Steinbrenner's record should not be laid to rest on this bitter note. As one of the last baseball teams to desegregate its lily-white roster, the Yankees were not exactly a paragon of fairness when Steinbrenner took over as principal owner in 1973. Inserting such black thunder in the lineup as Reggie Jackson, sometimes starting as many as six non-Hispanic blacks, Steinbrenner revived the lackluster franchise and once again made the Yankees World Champions. Granted, this towering man of excess was not shy about letting his team know who's The Boss. But unlike Limbaugh, he was not concerned about winning with whites only; Steinbrenner was obsessed with winning as an absolute birthright. Les Payne is a Pulitzer Prize-winning journalist based in New York.